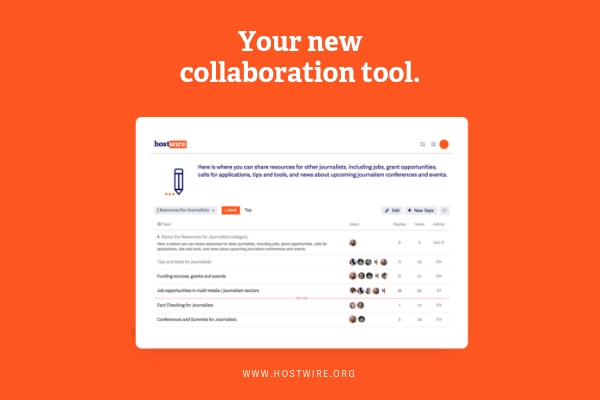 (Berlin, Germany) 27 November 2018 – Hostwriter, the open network that allows journalists to easily collaborate across borders, has launched HostWIRE – a new global crowdsourcing tool for journalists. HostWIRE is a chatroom where journalists can interact quickly and easily with other Hostwriter members, enabling them to find and share journalism knowledge and resources. When members are signed in on Hostwriter, they can simply click on the HostWIRE link to head to the chatroom. Inside the chatroom are categories such as “Resources for Journalists,” “Global Events” and “Search and Find.” Within the categories, journalists can find posts on topics including jobs and fellowships, grant and funding deadlines, article collaboration opportunities and upcoming conferences and events of note for journalists. Hostwriter is an open network that helps journalists to easily collaborate across borders. We connect more than 3,800 journalists from 136 countries to seek and offer help, whether in the form of local advice, story collaboration or accommodation. The Hostwriter team sees cross-border journalism as a tool to overcome national bias and prejudice, ultimately contributing towards better informed, more accountable and democratic societies. Click here for a link to our online press kit, including high-res photos.